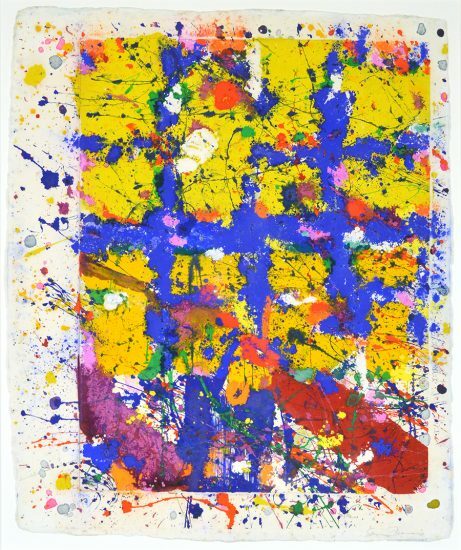 This work is stamped with the Sam Francis (San Mateo, 1923- Santa Monica, 1994) signature stamp and Sam Francis estate stamp on verso. 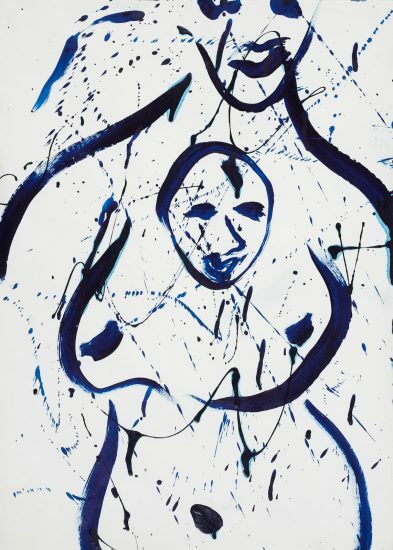 Sam Francis Monotype Untitled, 1977 whispers a very magical and luminous sensation. 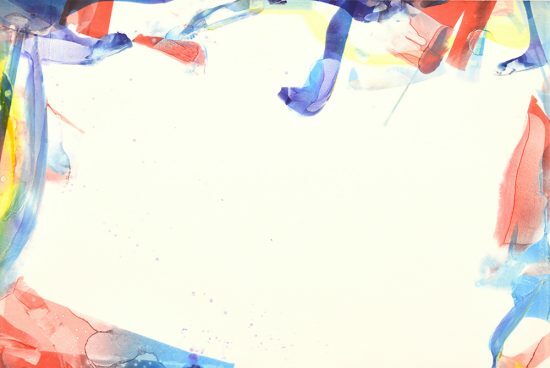 The colors that Sam Francis uses evoke a kind of emotional and spiritual sensation in addition to its obvious visual elements. 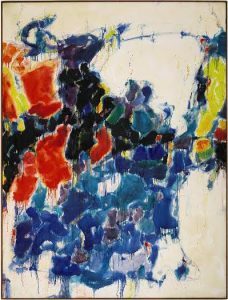 Simple and elegant, vibrant and poised, structured and controlled—these words essentially convey and at the same time do not do enough to encapsulate the mastery of Sam Francis within this magnificent work of art. The wonders of this piece lie in not just the crisp color palette but also in the compositional structure. 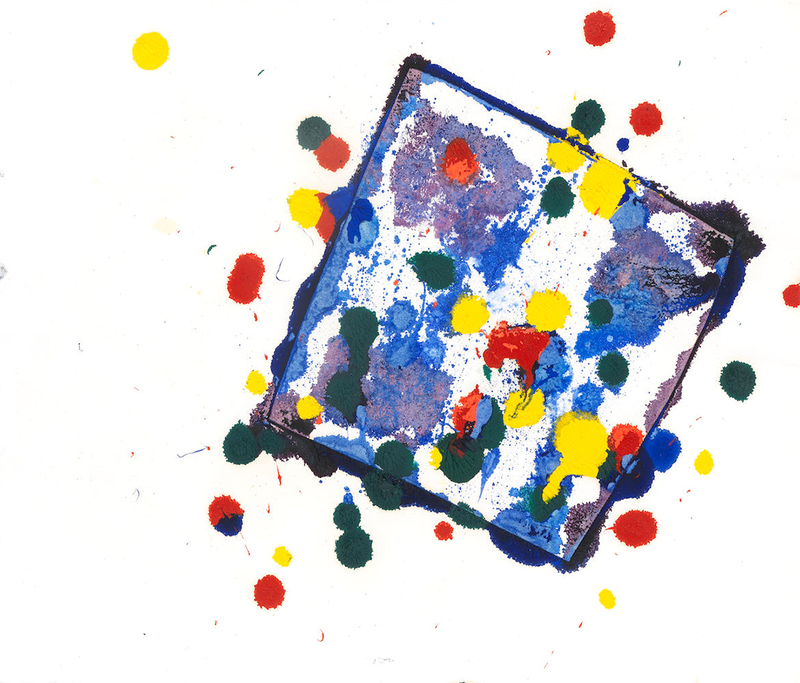 Mainly orchestrated within the strong square, the ink splatters flutter around each face of it. Daintily painted crimsons, blacks and even yellows are strewn sporadically, creating a textural emphasis. The clean planes of the square along with its calming indigo and blue hues allow for a euphoric feeling that immediately washes over the viewer. 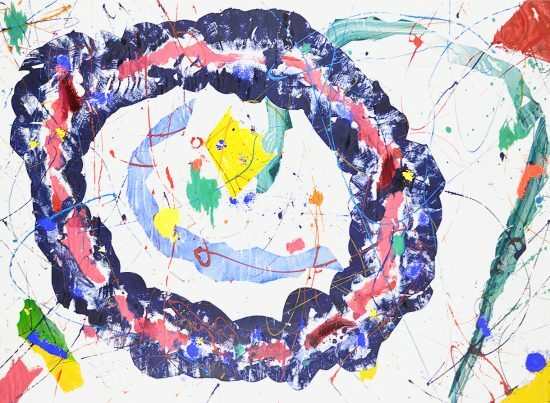 As an abstract expressionist, Sam Francis extends the beauty of this piece from his own imagination and translates a visual manifestation onto paper. The clarity and purity speaks volumes as to who he was as an inventor and artist. 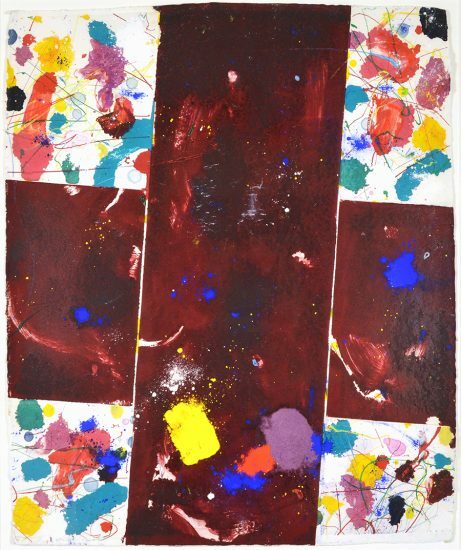 Created in 1977, this Sam Francis unique original monotype with oil paint, and dry pigment on handmade paper is stamped with the Sam Francis (San Mateo, 1923- Santa Monica, 1994) signature stamp and Sam Francis estate stamp on verso. 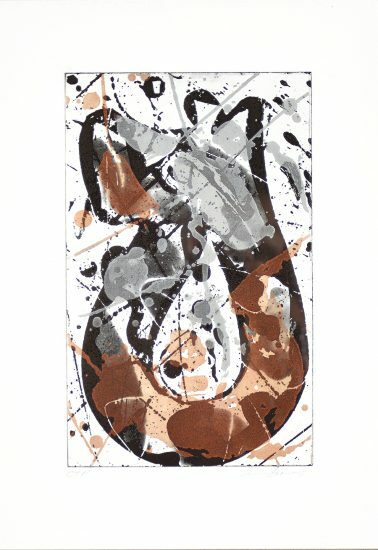 Sam Francis Monotype Untitled, 1977 is fully documented and referenced in the below catalogue raisonné and texts (copies will be enclosed as added documentation with the invoices that will accompany the sale of the work). 1. 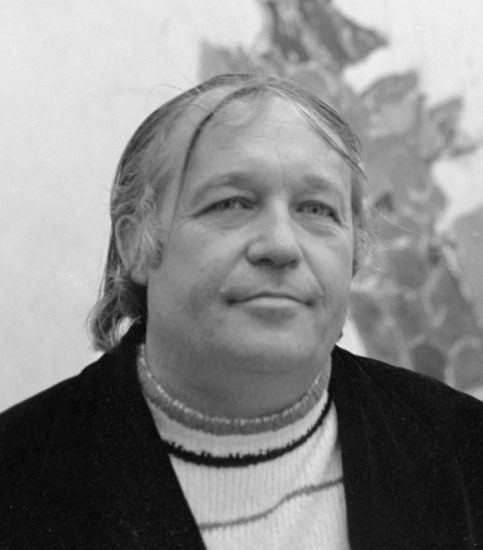 Tullis, Garner, Sam Francis, and Pontus Hulten. 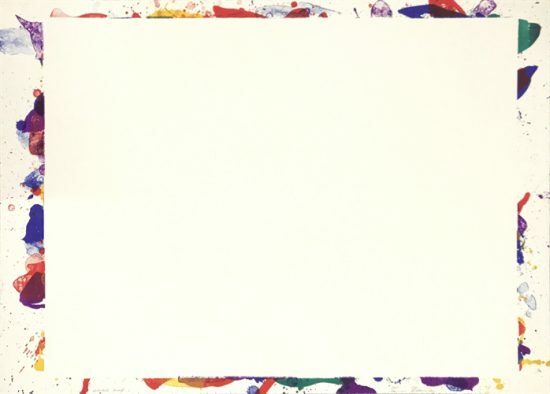 The Monotypes of Sam Francis. 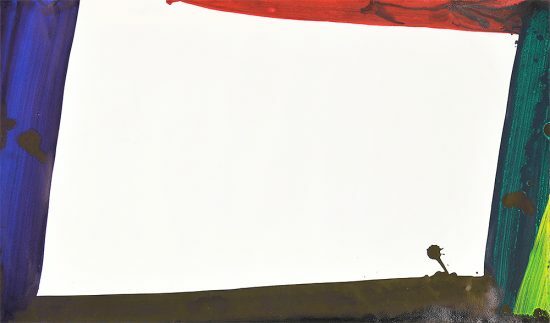 Stuttgart: Daco-Verlag, 1994. Listed and illustrated on pages 48-49. 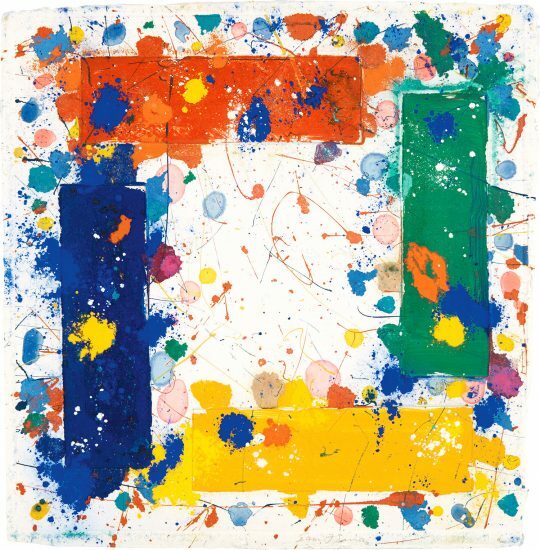 Framed to museum-grade, conservation standards, Sam Francis Monotype Untitled, 1977 is presented in a complementary moulding and optical grade Plexiglas.